Not much entertainment, but a few bars around, a taxi into Trianda was approx 8 euros where there was more entertainment. The only thing to remember is this resort is only 10 minutes from the airport so there is a lot of overhead flights landing. Ialyssos was a nice little resort with a few shops, bars and resaurants. The beach was coarse sand and pebble but nice enough. It is pretty much always windy though, which helps keep the temperature bearable. The Blue Bay is quite a way from the town, not like we had been told by the travel agent but the sunshine club is just 5 minutes walk. Rhodes town is only a 15 minute drive away and well worth a visit, especially the old town. Ialyssos is a mix of old and new - the beach front has a mix of very modern club style restaurants/tavernas and the more traditional Greek older style ones. The beach is mainly stony but very clean with plenty of sunbeds. There are lots of small tourist type shops to browse in and one or two more classy clothes shops. The main road area tends to be a bit more scruffy and run down in areas but there are good shops in the vicinity including a Carrefour and a bakery. Be careful of the pavement condition if walking and take a torch at night. Access to the rest of the island is difficult especially to the other side (less windy side) without a car or the use of a taxi although buses travel into Rhodes town regularly and are not expensive but can be crowded. Taxis are freely available but can be costly - check your price before you travel. CARNT REALLY COMMENT ON RESORT ENTERTAINMENT AS THERE WAS NO WHERE OPEN.BEACH IS PEBBLES AND SHAIL AND PARTS OF IT WERE A BIT UNKEMPT MAYBE DUE TO BEING OUT OF SEASON. I HAVE BEEN TO THIS RESORT ONCE BEFORE A FEW YEARS AGO AND IT SEEMS TO HAVE DETERIATED A LITTLE SINCE THEN. BUT ALL IN ALL HAD A GOOD HOLIDAY. Typical of most greek resorts, lots of tavernas and restaurants all of a similar quality and price. Resort is clean but roads and paths are uneven (typical greece). Range of bars one or two clubs, bars showing football and rugby matches if it takes your fancy. Beach is shingle and you need something for your feet to enter the water. Two sunbeds and umbrella 7 euros per day, beach certainly not packed, plenty of sunbeds, a cooler alternative to laying by the pool where the temp mid day reaches the 40s. Recomend the resort to any family with teenagers, plenty to do, enough places to eat that you don't have to repeat if you don.t want to. Good Holiday choice. 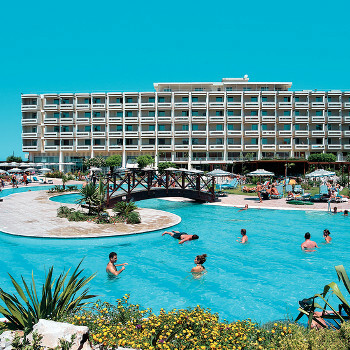 Great little resort, handy for Rhodes Town and the airport. Plenty of good bars and eateries at reasonable prices. We used taxis from airport to the hotel rather than transfer coaches. The resort was ok there are plenty off banks etc. Theres a good choice off tavernas and the odd english bar there is enough choice for food etc would off liked to have seen more entainment not just karoke.The beach was clen enough but not sandy We would visit the resort again. The resort trianda is ok, Plenty of tavernas good food, most are friendly. Rhodes is about 15mins away and well worth a visit. Habour is full of life and very clean. The old city is just magical by day7 or night. Ixia was too far away to walk but you could get the bus. Theres a good bakery selling 'to-die-for' cakes just a few minutes from the Kassandra and a little further on there's a massive supermarket.Trianda had a lot of bars and restaurants but they were mostly empty! The best place to eat in Trianda, believe it or not, was a street cafe in the main square. We ate there 5 times during our stay. Rhodes Town is really nice, just beware of those 'scratch card cons'. We took 3 excursions, the first to Marmaris in Turkey which was brilliamt despite the 120 degree heat! We also took a boat trip to Lindos, what a really nice place, stay there if you can! Our 3rd trip was to Symi. This place really takes your breath away, its stunning, quaint, bustling, friendly and really relaxing. You cant visit Rhodes without going to Symi.